Rates: starting at only $75, the cost of your course depends on the type of classes and on the amount of Spanish lessons you have. Reasons for Travelers to Learn Spanish: if Central or South America is your destination, learning Spanish will dramatically improve your holiday experience. Skills You'll Get: checkout what you'll learn in this 1 - 5 day course in 4 - 20 hours of basic Spanish lessons. Start Dates: you can start this basic Spanish course whenever you want to (as long there is a teacher available for you!). We recommend having this course at the beginning of your Central and/or South America journey. If you're serious about learning Spanish and are looking for a more holistic approach you should consider our Group 4 Spanish Course or a Private Spanish Class. If you can study for more than a week, already know some Spanish and want to brush up what you've picked up during your travels or learned at other Spanish schools in Latin America, then our Group 4 Course or Private Spanish Lessons might be what you're looking for. It all depends on what you want and how much time you have. If you already know some Spanish we can easily arrange a One to One Spanish Class for less than a week. Please Contact Us to reserve a Spanish teacher or to enquire about availability. The cost of a Travelers Spanish Course depends on the amount of hours you sign up for and if you have private lessons or mini group lessons. A minimum of two students of the same level traveling together makes a mini group and can begin classes on any day of the week. If you really want to discover something amazing, get past the language barriers and embrace a culture and a way of thinking that is so far away from what you know, then learn Spanish! The best part of traveling is the people: get to know them, be able to speak their language! Sightseeing can be interesting and ecotourism in Latin America is wonderful, but what about getting to know and understanding those who have shaped that reality surrounding you? If a landscape, a monument or an excursion can blow your mind away, imagine how meeting a person from a different culture can enhance your vision of the world. Taking a Spanish course at the beginning of your trip will make your Latin American vacation an unforgettable experience. Speaking even a little bit of Spanish will make a huge difference! Think about what 1 - 5 days (4 - 20 hours) of Spanish studies can do for you. It's totally worth it! Have a handful of basic and useful words, phrases and common expressions for everyday situations. Learn how to make simple requests and questions to get information from locals, e.g. ask for directions. Learn basic Spanish vocabulary for health related, emergency, border, customs and police situations. Be your own guide. Make your own travel plans: get the buses and taxis go where you want to go. Handle currency, time and dates: numbers and amounts. 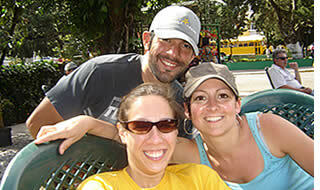 Learn idioms and get tips on the Central and South American culture and customs. If you're serious about learning Spanish then you might consider signing up for several weeks in our Group 4 course. Our first three levels take an average of 60 hours of group lessons to complete so in only three weeks you'll be able to complete at least one of our Spanish levels. If you're making your journey with a group of friends and plan to have Spanish lessons for the entire week from Monday to Friday we can schedule four hours of mini-group lessons in the morning or in the afternoon and leave the other half of the day for you to explore Boquete, Panama City or Bocas del Toro. Our team will be more than happy to assist you and help you plan all the ecotours that you would like to do in Boquete, Panama City or Bocas del Toro, Panama. Want a real Latin American vacation? Learn Spanish and meet the locals! Contact us! Travel Tip: Keep Your Luggage Light! When you're traveling through Central or South America you do not want to keep adding weight at each stop you make. Leave more space for souvenirs and invest in something that you'll be able to carry through out all your journey without adding weight to your luggage: LEARN SPANISH. Besides, you'll be able to take it back home without paying for extra luggage and you'll also have a lot more of unforgettable experiences to take back home if you're able to speak Spanish: the best experiences come from the people and its culture. What to do in Boquete, Panama? If you're into Whitewater River Rafting adventures, the rivers born in the highlands of the nearby volcanoes offer breathtaking scenery and high doses of adrenaline thanks to their constant rapids. Chiriqui Viejo is a world class river that has it all. The Quetzals Trail is one of the most gorgeous hikes in Central America. This path connects the town of Guadalupe in Cerro Punta on the west side of the Baru Volcano with Boquete, which is on the east side. You can make this hike in any of the two directions, although it is much easier from Cerro Punta to Boquete because it is more down hill. The cloud forests of Boquete offer amazing opportunities for Bird Watching. In the Zip Line Canopy Tour you can glide through the canopy of century-old cloud forests, high above the pristine rivers and waterfalls that make up the incredible collection of natural landscapes bordering the National Park La Amistad and the famous Baru Volcano. It has 3 kilometers in total length and is divided into 11 different zip line cables. A harness, an ultra resistant steel cable and gravity are the only elements necessary to stipend and propel the "fearless rider" in this incredible "adrenaline rush". If you want to relax, on the road to Boquete you can encounter a place known for its famous Hot Springs. Caldera, meaning boiling pot, is just next to the Caldera river, which serves as a refreshing cool-off after bathing in the hot springs. Enjoy a refreshing dip in the Caldera River and marvel at the smooth and warm boulders and hot pockets of water within the river itself. Rock Climbing and Rappelling are becoming very popular sports in Boquete. In Bajo Mono, just 15 minutes away from our language school you can find some pretty impressive walls that can challenge even the most experienced climber. Tours are organized and provide all the necessary equipment. Mountain Biking is an incredible way to discover the enchantments of Boquete.